I’ve looked at 1440P monitors way back in retail stores and was always amazed at the sharpness and crispiness of the images displayed. The few I’ve seen and been fascinated with are the Apple Cinema Display and the Dell Ultrasharp monitors (all the 1440P models 27” and above). Everything just looked so good. Picture quality, colour reproduction, sharpness… everything is just beautiful! I knew that it was a huge step up from 1080P but the cost of such monitors are just insanely high. Then came the introduction of the budget Korean 1440P monitors. It was a gift sent from the heavens. There were worries and doubts over the quality of said monitors. I mean how can they price their products at almost half the market price? For instance in Singapore then, a Dell Ultrasharp U2711 cost around $800. The Korean monitor (regardless of brand) cost only $440 delivered right to your doorsteps. Taking note of prices today, a Dell Ultrasharp U2713HM costs $759 and a barebones Korean monitor costs $300 thereabouts. Even if you were to take a higher end model (with additional input ports) costing roughly $400, it is still a whopping 47% price difference! Now I’m not here to discuss so much about the Korean monitors (since I’ve already done so before) but more of the 1440P resolution. There are many types of display setups be it multiple monitors, larger screens etc. I’ve tried a dual 1080P monitor setup (two 24” monitors) and now currently a single 1440P monitor setup (with the option of an additional 24” 1080P monitor but I usually turn that off). I must say that while many people say dual monitors (or triple/quad/etc) are best for productivity, I find that a single 1440P monitor does wonders as well (at least for the general users). The screen estate you get wouldn’t be as much as a dual 1080P setup but it is sufficient enough for most people. It ultimately depends on the work you are doing (or gaming for that matter) but from what I’ve experienced, I can live with just one monitor that is 1440P. The more is definitely the merrier but the additional workload on your system isn’t exactly ideal for some. Also, a 1440P monitor does look better in terms of general display quality. The higher pixel density certain helps makes things look sharper and colours more vibrant. I had to, momentarily, switch back to a single 1080P monitor for a few days while waiting for my new 1440P monitor to arrive (more on that in the next few days). I suffered terribly as the little screen estate was killing me. I basically had only one window maximized at one time for maximum efficiency. I couldn’t, like before, watch a video at one side while browsing the net on the other. Technically I could but I would not be able to enjoy the video or be able to see most things on the browser. Screen estate is just so important. When it comes down to work be it coding, writing a document or even general usage, screen estate is vital for efficiency. That’s why people say more monitors is better and I do agree to a certain extent. For instance, having the option of coding at one side while maintaining the output preview on the other just makes workflow so much smoother and productive. 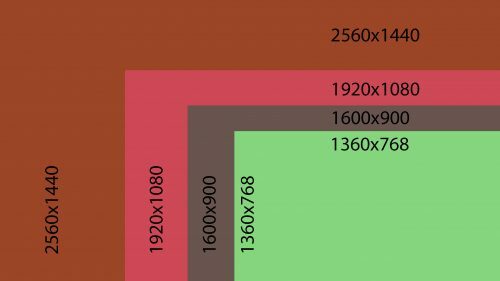 There are certainly trade-offs when using a higher resolution. The most obvious one is the higher workload on your graphics card (similar to that of multiple monitor setups). That said, in terms of general usage and for most people that aren’t gaming, the extra screen estate that comes from the 1440P resolution is so useful and most modern day computers should be able to support it. Looking for an upgrade for your setup (any kind of setup, entertainment, work or general use)? Look for a 1440P resolution monitor today (or 4K for that matter)!